Move over Ping-Pong, make room for Basketball. The NBA is surprisingly huge here. After Soccer it’s probably the biggest spectator sport in the country. The NBA play-offs are broadcast twice a day here, live at 8AM in the morning and then again at night, followed by a highlights show with Chinese talking heads summarizing the game. We were woken one morning by excited Chinese San Antonio Spurs fans cheering on Tim Duncan and crew a few doors down. 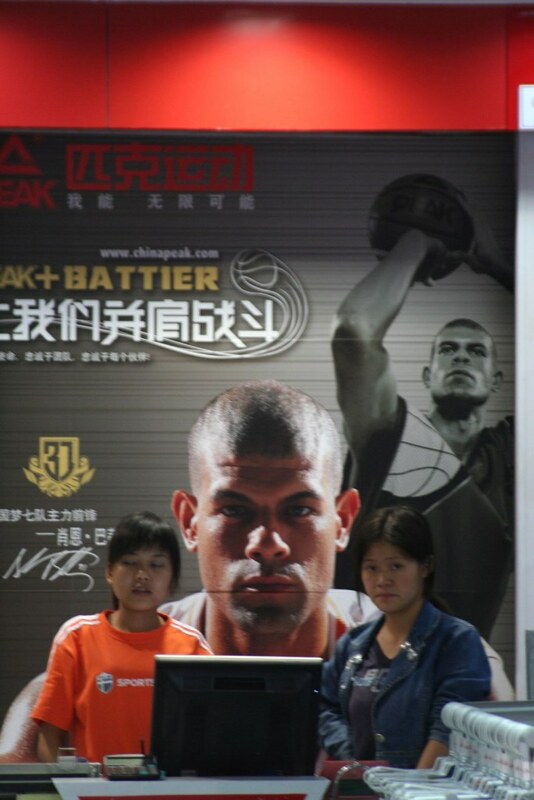 And basketball has kind of a surprising poster-boy here, everyone knows Yao Ming, but the player with the most exposure in China right now is …Shane Battier? Yes, Shan Bati-rrr (as it’s pronounced here) is everywhere! His handsome mug is plastered over billboards, city buses and his commercials play on TV all the time. You’d think this kid was the next Jordan the way China has embraced him. So, the obvious question: Why Shane Battier? Well, rather than take a B-List or C-List contract with Nike, Shane chose to sign an endorsement deal with “Peak” sportswear, a China based rival. Thus instant Superstardom for Shane – in China.